Dr. Grace is excited to join Modern Kids Dentistry in the new office location in Nicholasville. Originally from Paducah, KY, she came to Lexington in 2000 where she attended the University of Kentucky. During her undergraduate years, she was a resident advisor and studied abroad for one semester in Morelia, Mexico. In 2005, she graduated from the University of Kentucky with Bachelor of Science degrees in Biology and Spanish. Dr. Grace then went on to earn her Doctor of Dental Medicine degree from the UK College of Dentistry, where she was dental school classmates with Dr. Justin Raybould. She completed a General Practice Residency at UK and then spent one year working at the Family Care Center as the dental director. In 2013, she completed her pediatric residency and joined Danville Pediatric Dentistry where she has worked for four years. Dr. Grace is a board certified pediatric dentist through the American Academy of Pediatric Dentistry. During her four years in dental school, Dr. Grace became interested in dental mission trips and traveled to Honduras four times. Combining her love for dentistry, helping others, and speaking Spanish, dental mission trips have become an important part of her life and who she is. Since 2011, each January Dr. Grace has gone on a medical/dental mission trip to Guatemala and hopes to continue this tradition for years to come. She is an active member in her church and where she taught Sunday school for 6 years. 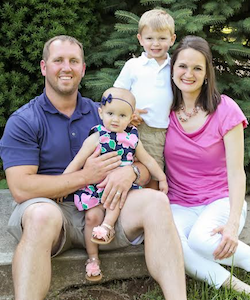 Dr. Grace resides in Nicholasville, KY with her husband Josh and two children, Logan (3) and Ava (1). The family is also expecting a baby boy in October 2017. In her spare time, she enjoys spending time with her family and friends, traveling, and running. Dr. Grace looks forward to creating a positive dental experience for your child at Modern Kids Dentistry of Nicholasville.